Catfood Weather is a free taskbar based weather forecast app for Windows that includes a seven day forecast and severe weather alerts. It uses National Weather Service data and works for any US location (by ZIP code or latitude and longitude). This update fixes a problem calling the National Weather Service API, so please install 2.30 if you're using a previous version of Catfood Weather. To get alerts for new releases follow the RSS Feed or sign up to the ITHCWY Newsletter. Is it just me or is the weather radar smiling at San Francisco right now? Catfood Weather 2.20 fixes a problem with the forecast failing to update (the National Weather Service changed the URL of the web service that Catfood Weather uses and while they were kind enough to put a redirect in place it was a form of redirect that didn't play nicely with WebClient so a patch is needed). In addition this release should fix the ignore alerts feature. It's one of those cases that after not having looked at the code for a couple of years I suddenly realized that the implementation was fatally flawed (bordering on idiotic) and could never have worked. Should be better now. 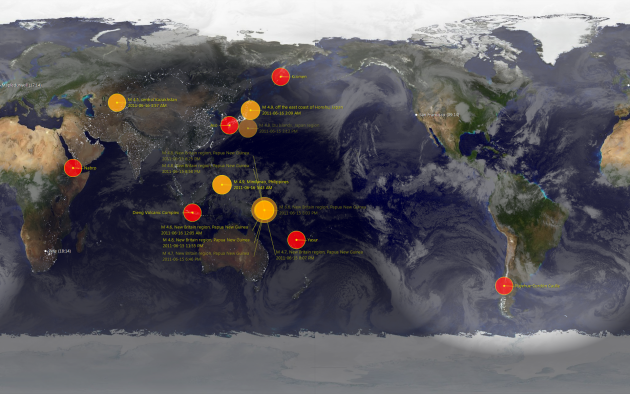 Catfood Earth 3.10 includes rotation to longitude / solar time, volcanoes, a screen saver, time zone updates and more. Catfood Earth uses satellite imagery and a variety of data feeds to render jaw-dropping live desktop wallpaper. Catfood PdfScan 1.10 saves your selected paper size and feeder choices. There is also an option to keep PdfScan open after saving a scan, something that had been bugging me when slogging through large digitization projects. 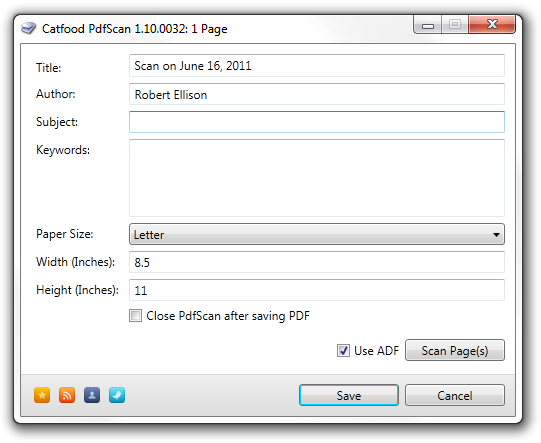 PdfScan is a free tool for scanning stuff into a PDF file. Catfood Weather 2.00 includes weather alerts and an updated UI. Catfood Weather provides a free, taskbar based weather forecast for US locations.